While the virtue of scones is in how quickly they come together, the beauty of coffee cake lies in how easy it is to make ahead. If you have extra freezer space (I know, very funny), you can even store a baked one, tightly wrapped, against emergency brunch needs! 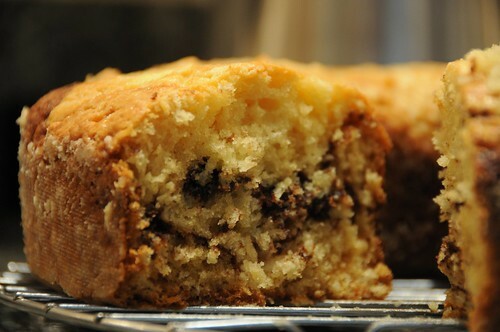 This one is a pretty everyday cake: it’s not super-rich, topped with streusel, or filled with chocolate chips. (That last one is coming, I promise.) But these very features are the ones that have given it the power to convert the “coffee cake is always too sweet” crowd (by which I mean “my mom”). Although it contains both cocoa powder and instant espresso, both flavors show up as a depth of flavor, rather than with strong tastes of their own. Preheat the oven to 350°. Grease a bundt pan well, remembering to grease the center. Although I don’t generally like it, if you’re using decorative bundt pan, cooking spray is probably your friend here. Add about half the sour cream and mix, then add the flour, baking soda, baking powder, and salt. Finish by adding the rest of the sour cream. Now find a little bowl and put the remaining two tablespoons of sugar in, along with the cocoa powder and espresso. 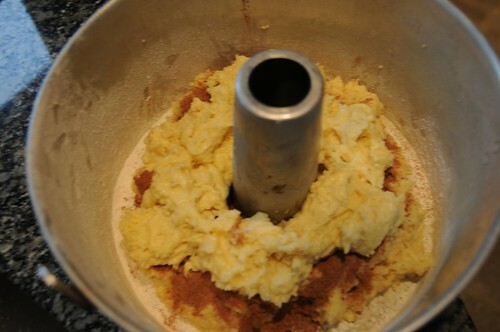 Take half of your batter and make a ring around the center of your bundt pan. The batter will be stiff! Then top it with the espresso-chocolate mix, and arrange the rest of the batter in a second ring on top. It’s going to look extremely lame. I swear to you that the cake in this photo is the same as the cake in the first photo! The oven makes it all okay. Trust me. Now you’re going to bake it. Start checking at 30 minutes, especially if you’re using a larger pan. You can jiggle the pan — it should be set all the way through — and then test with toothpicks. It should take about 40 minutes in a larger pan and 50-55 minutes in a smaller one. Let it cool completely before turning it out. Serves eight generously or 16 as part of a meal. *Here’s where most recipes are going to tell you to add eggs one at a time. In the end, it doesn’t matter much, but you may find it easier to mix them in if you do them singly. Funny, I find coffee cakes less sweet than traditional cakes. I’ll have to give this one a try. @Amanda – me too, but even they are usually too sweet for her!